Going south on the Parkway in Pigeon Forge take your first right past light #7 (Old Mill Ave.) onto Ogle Drive by the Marathon station. You will go one half mile on Ogle Drive till you come to a small bridge. Immediately after the bridge take a left onto Tinker Hollow Road. You may wish to look at your odometer here, because Tinker Hollow is a 1.1 mile long country road that will seem like five miles to you. When you get to the dead end it is obvious. There will be a sign pointing you up the left to our driveway. The driveway goes up and down and back around with the kennel being a reddish-brown concrete block building. Coming north on the Parkway in Pigeon Forge go through light #8 (Dollywood Ln), taking a left on Ogle Drive by the Marathon station. 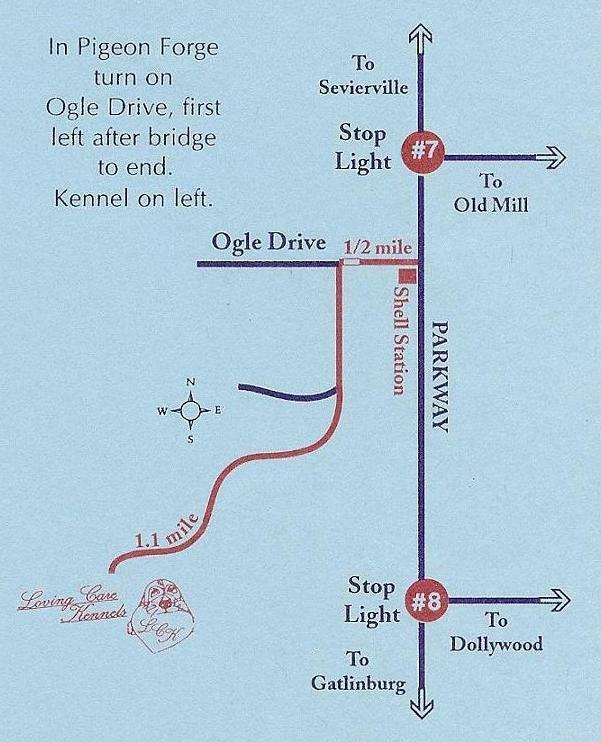 You will go one half mile on Ogle Drive till you come to a small bridge. Immediately after the bridge take a left onto Tinker Hollow Road. You may wish to look at your odometer here, because Tinker Hollow is a 1.1 mile long country road that will seem like five miles to you. When you get to the dead end it is obvious. There will be a sign pointing you up the left to our driveway. The driveway goes up and down and back around with the kennel being a reddish-brown concrete block building.